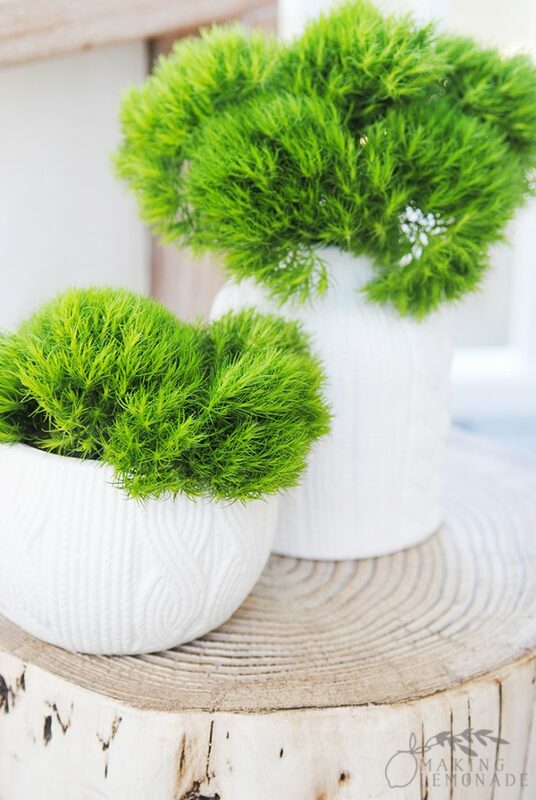 If flower arrangements aren’t your thing but you love plants in your home, check out our 5 tips for decorating your home with succulents and how to plant succulents in a pumpkin for beautiful fall decor. The other day I needed to put together several flower arrangements QUICKLY and on a budget. I ran out to my local Trader Joe’s (because it’s an open secret that TJs is the place to go for inexpensive flowers, right?) and filled half my cart with greenery and flowers. 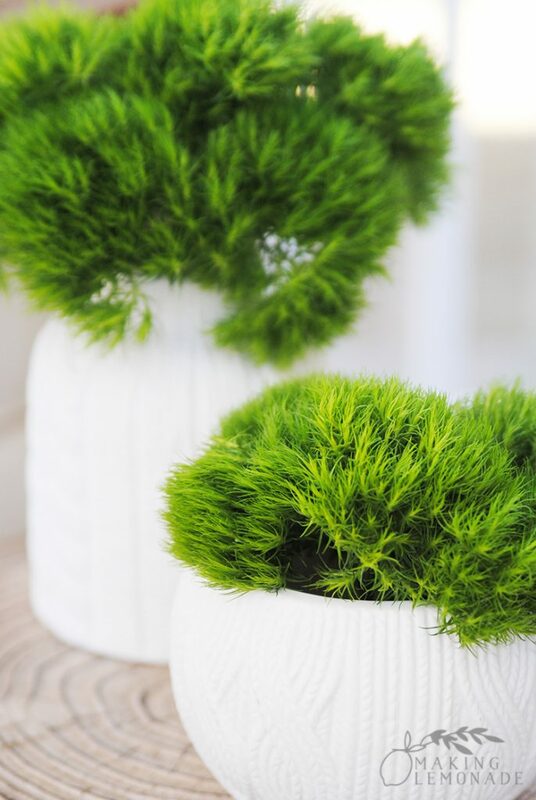 An hour later, they were transformed into the seven DIY centerpiece ideas in this post! 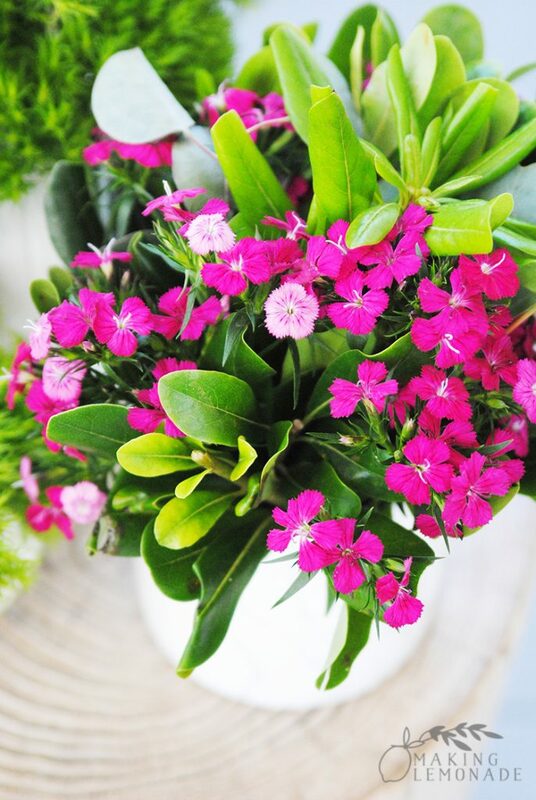 If you don’t have a Trader Joe’s nearby, almost all grocery stores have flowers that aren’t too expensive if you know where to look and how to arrange them– no experience prior floral arranging experience necessary. And they look so happy placed around your home bringing joy to every corner, so it’s worth the few bucks and 5 minutes to put together! Not sure if Charlie appreciates the flowers in the background, but I sure do. 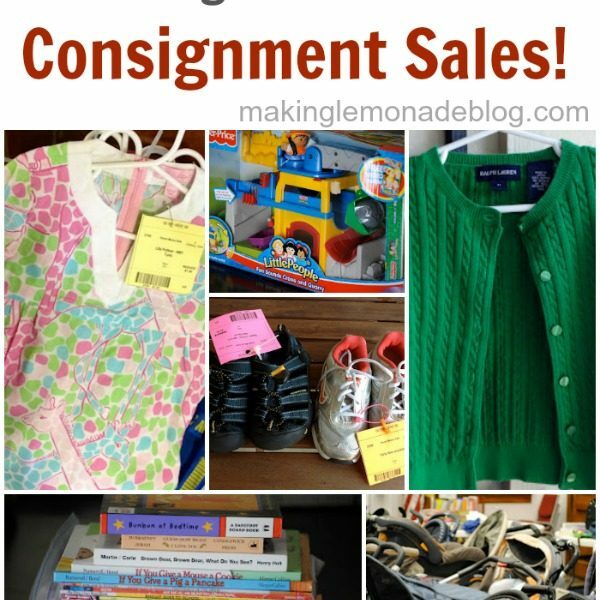 Step 1: Gather available containers from around your home. I used small vases, glass pitchers, a utensil canister and even a vintage soup tureen. Step 2: Once you figure out which flowers are going into which container, cut stems on an angle to the correct height to match that container. Try to have several levels to create layers of interest. I didn’t use floral tape to keep stems in place, I just packed ’em in and they look so full and lush. Step 3: Fill the containers partially with water and add the flower life extender they usually provide with bouquets as directed. 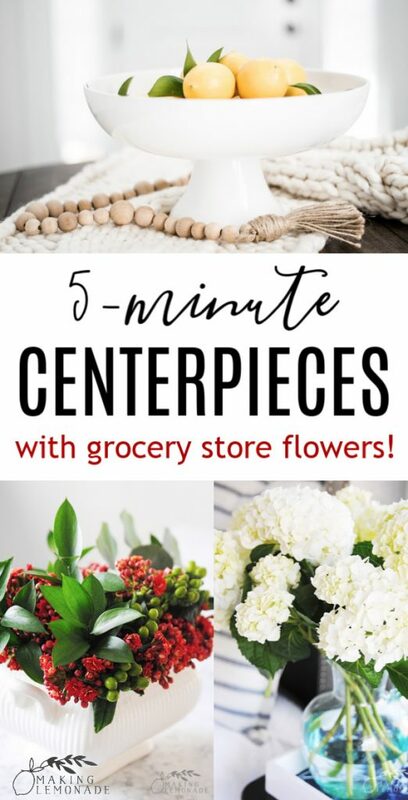 Then, add the flowers using the centerpiece idea ‘recipes’ below! This one is almost too easy, but the end result is modern and beautiful. I used two $3.99 bags of filler flowers (not sure of the name of the flower but it’s moss-like with stems) and put them in white vases. 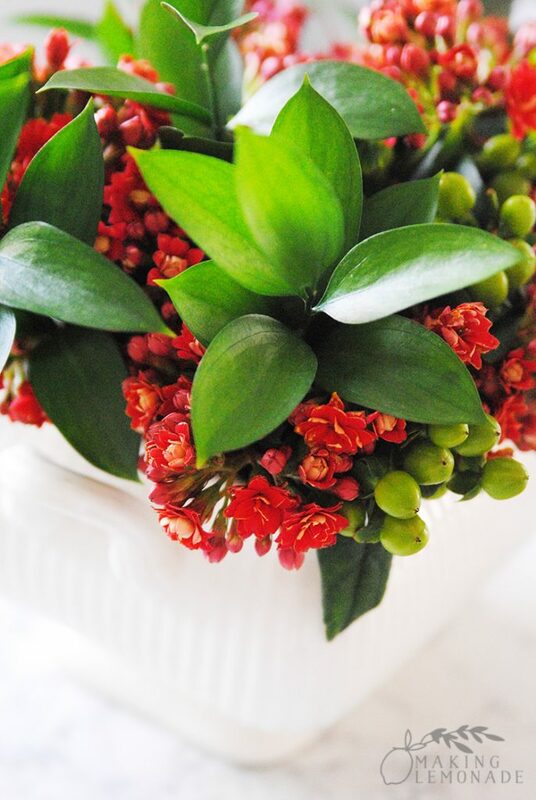 The best part is you can do this with JUST ABOUT ANY TYPE OF FLOWER OR FILLER! Go all pink, or all red for the holidays. 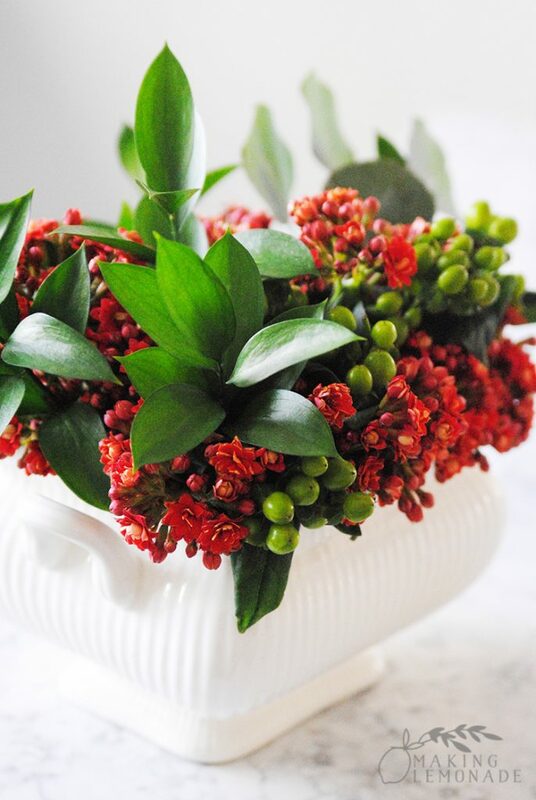 Use just tulips or all berries. 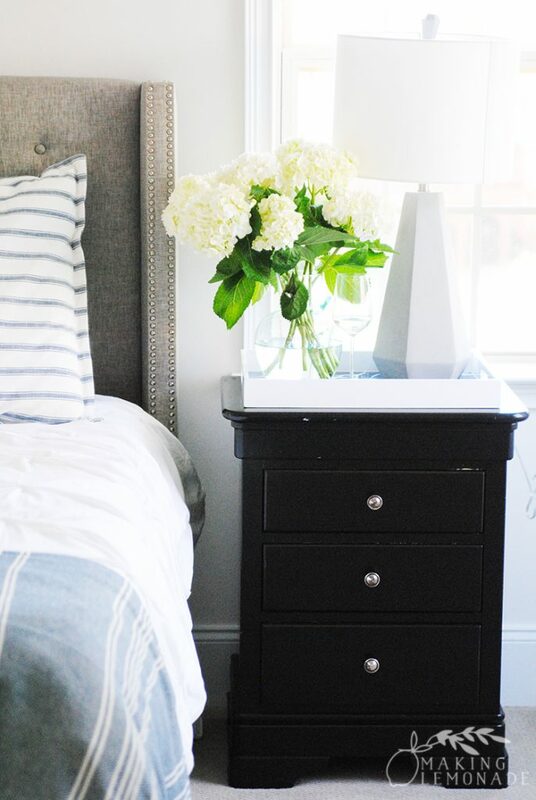 Even baby’s breath looks chic grouped together en mass. 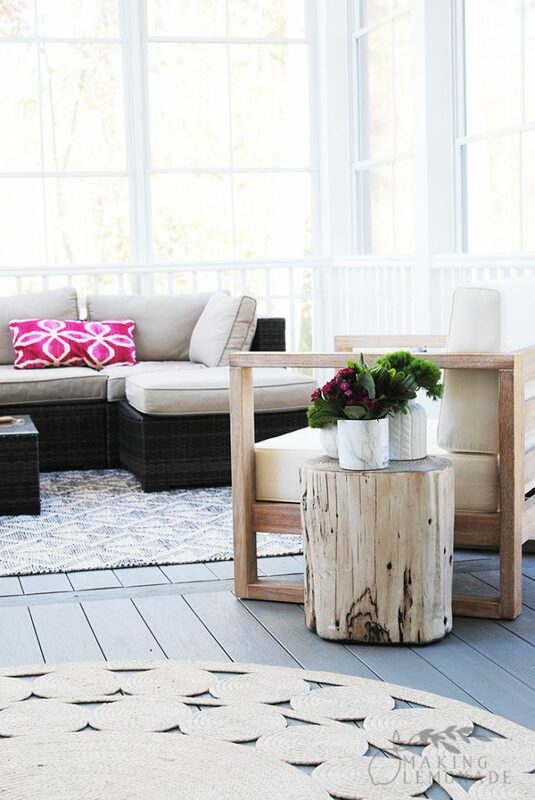 Use a contrasting vase or one that matches. It’s almost foolproof. 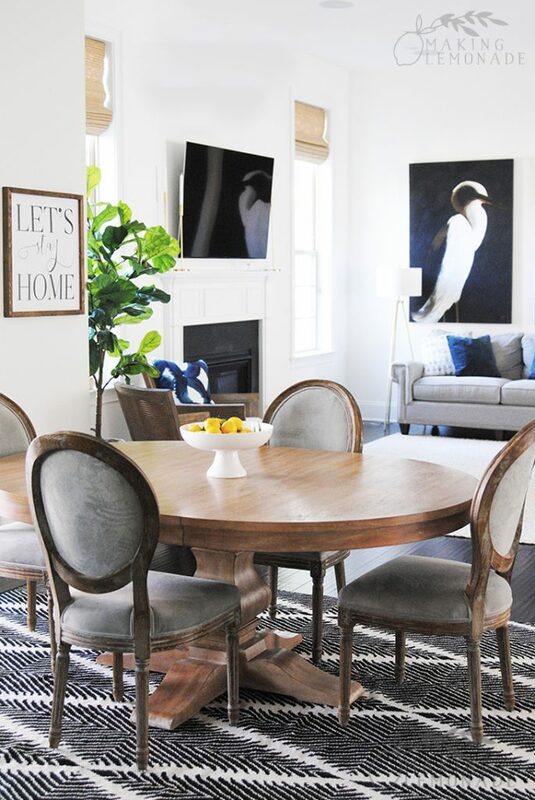 Personally, I love that they’re neutral and chic, but if you like color never fear– they provide the perfect backdrop to the next arrangement! This centerpiece arrangement uses just filler flowers, too There’s two $3.99 bunches of flowers in here. Using dark green allows the pink to really pop against it! 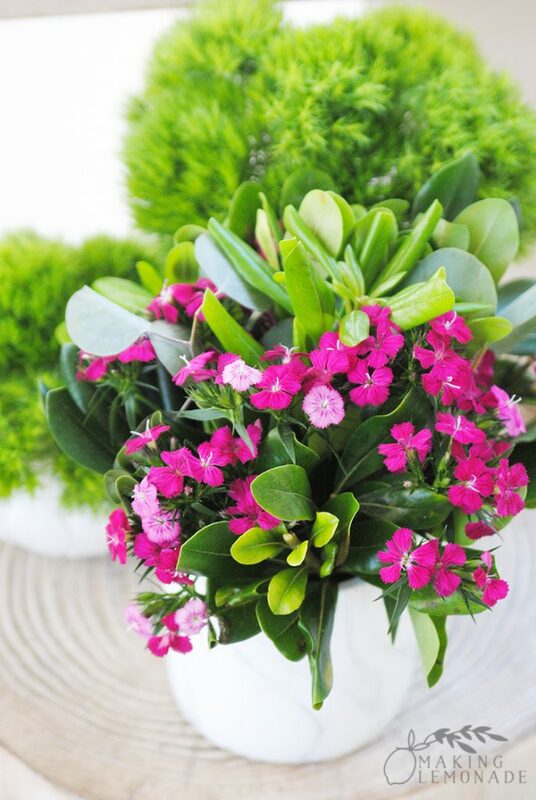 To arrange them, I started by placing the pink flowers inside, then added in the dark green around it. Afterwards, I tucked in a few leftover pieces from other arrangements (the broad leaf eucalyptus looks pretty.) Easy peasy lemon squeezy. Doesn’t it look great paired with the filler flowers from above? They match our porch, ha! 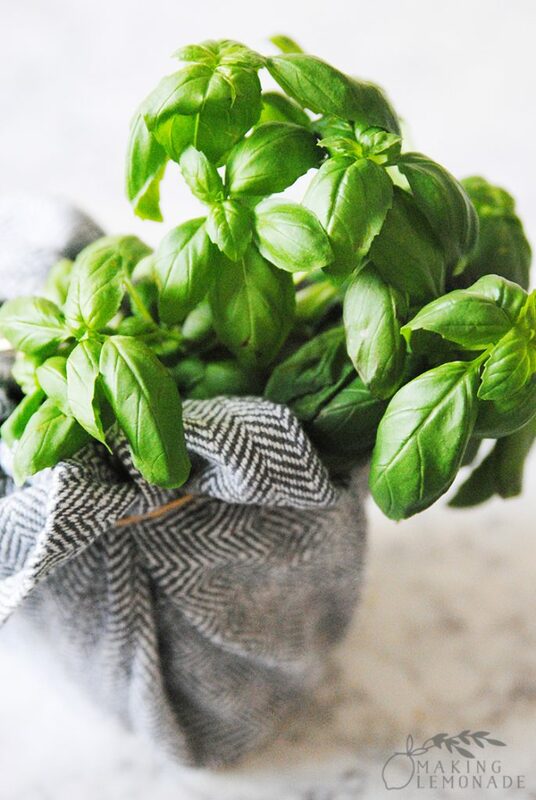 This little basil plant was $3.99 at Trader Joe’s, but you can find inexpensive herb plants at many stores– grocery stores, the garden section of home improvement stores, I’ve even seen them in the garden section of Walmart. I took a cloth napkin and tied it around the bottom to hide the pot, you can use a pretty dishtowel or inexpensive burlap and quickly turn this into a budget-friendly gift idea as well as living home decor. 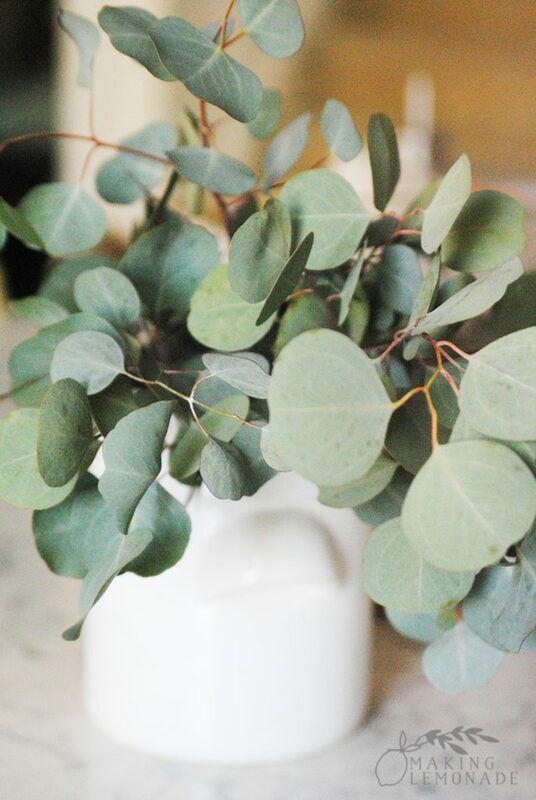 GAHHHH these large-leaved eucalyptus are my favorite. 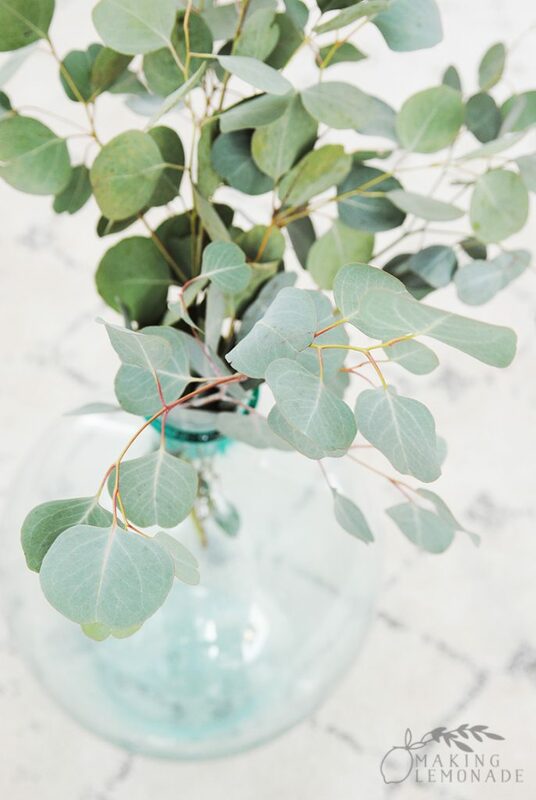 You can always use regular eucalyptus from the florist, but for some reason I love the large, sage-green leaves of this variety! And I also stuck them in a utensil canister and put them on our kitchen island. 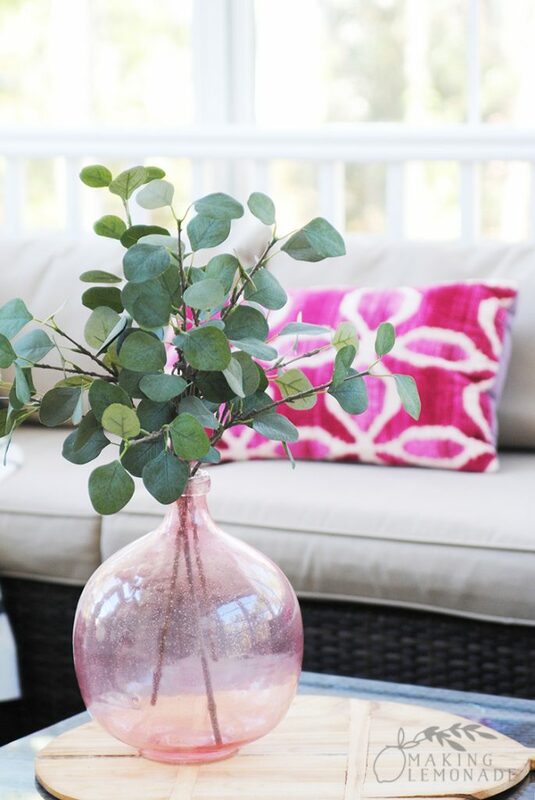 For another idea, we have faux stems from the craft store on our porch in the pink glass demijohn vase I snagged at the Nordstrom Anniversary Sale. 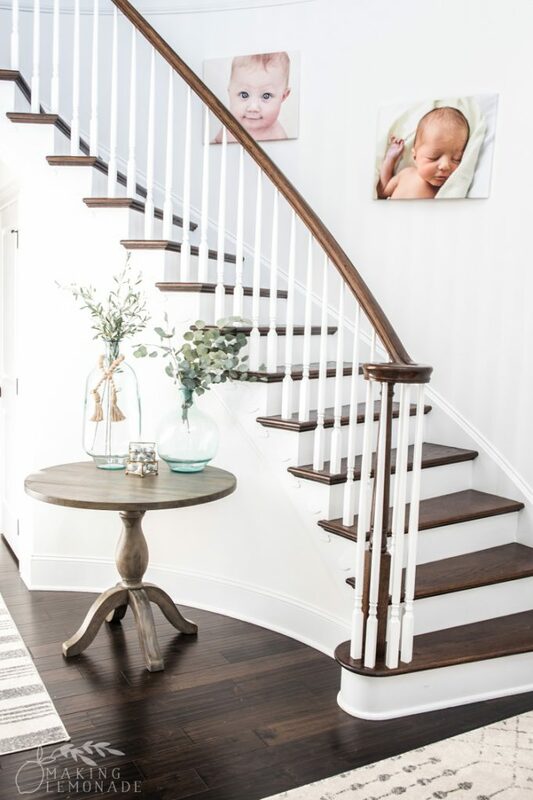 And… also in our entryway. I’m officially obsessed. 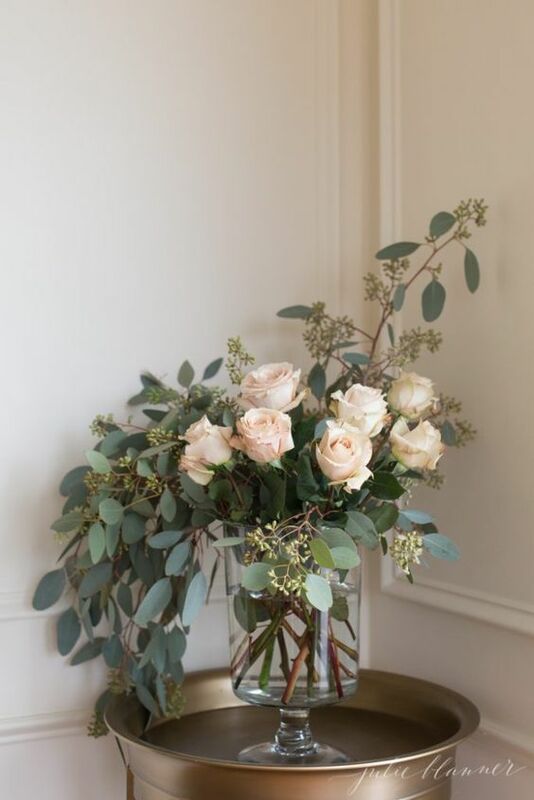 This floral arragement idea from Julie Blanner is gorgeous. Notice how she has the filler draping down one side, and a stem of it adding height on the other to create balance. Then, seven roses are placed in the middle. 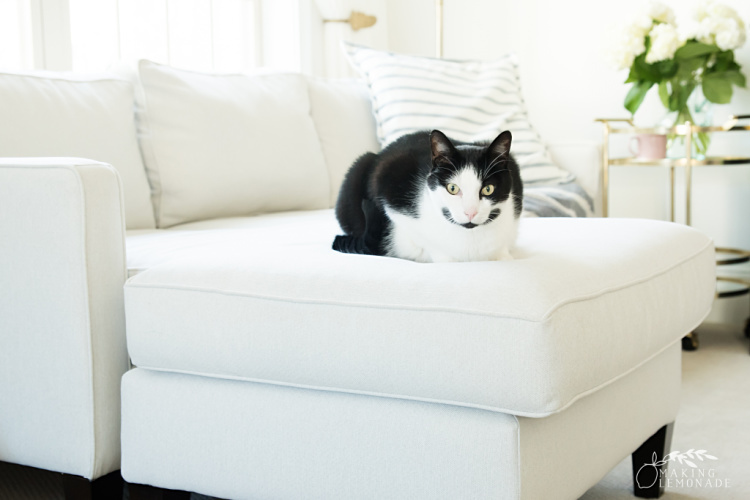 Simple, stunning, and chic! For this centerpiece, I used a vintage soup tureen that I got a thrift store years ago. First, I placed the red flowers at similar but slightly varied heights in the tureen (taller towards the center). Then I placed the stems of berries to break up the red, and last tucked in a few pieces of dark green foliage to provide some height and contrast. Wouldn’t this look beautiful on a holiday table or even on a kitchen table or island? This is the most expensive of the arrangements in this most, and just about as S-I-M-P-L-E as can be (and I make no apologies for it!) 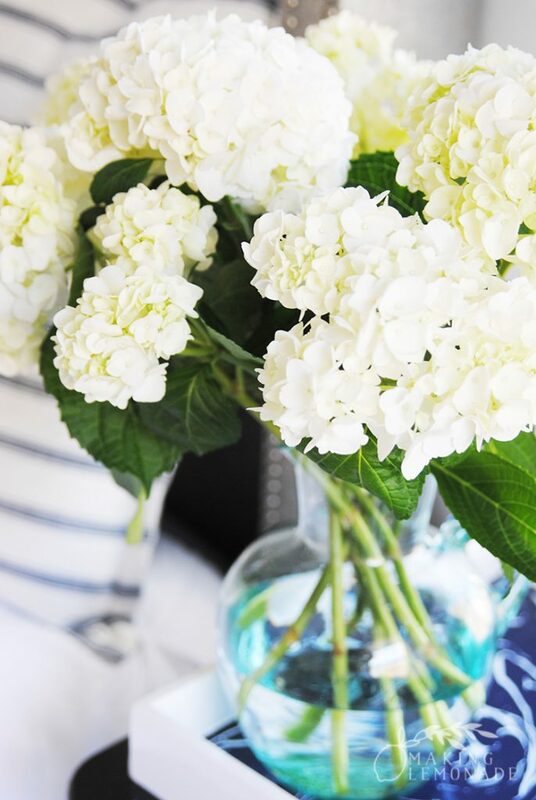 I used three hydrangea bouquets that cost $5 each at Trader Joe’s and placed them in a pitcher. It’s simple, easy, and they’re still going strong a week later. Don’t they look beautiful placed beside the bed? They’re giving me life right now in the middle of a dreary, rainy week! 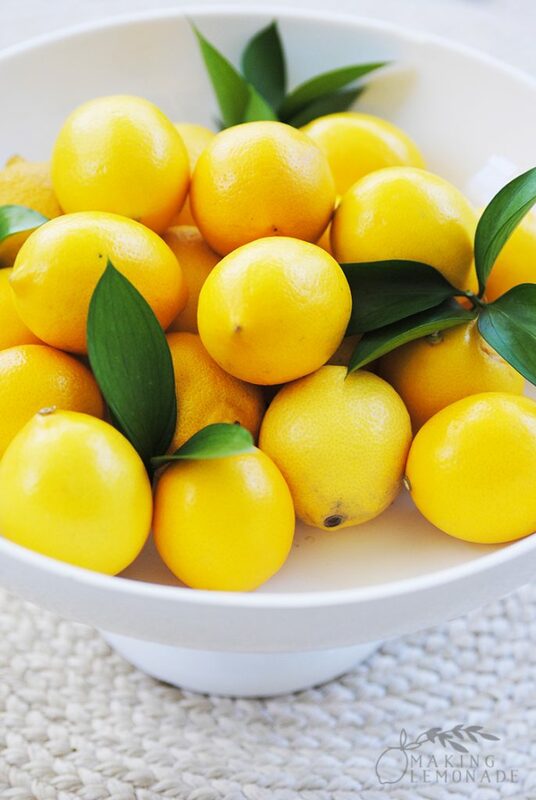 I’ll admit I’m partial to lemons (wink!) but this would add a touch of sunshine to any home. 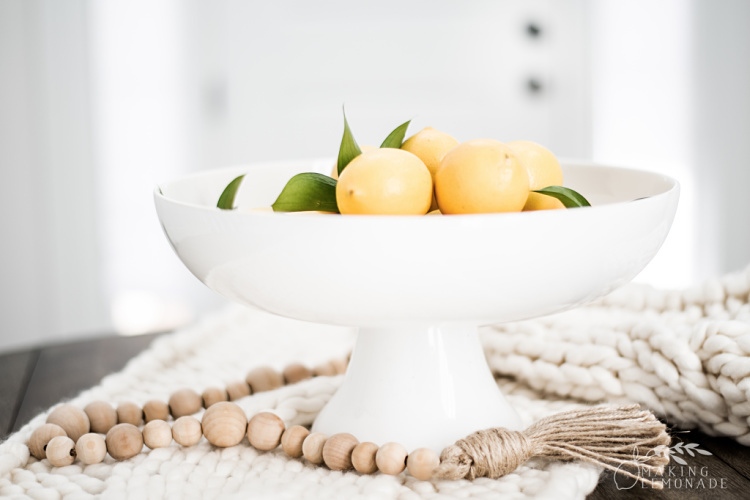 I used a pedestal bowl I bought years ago at Crate & Barrel, but you can use a tiered stand such as this one or even a tall, clear cylinder vase and arrange the lemons inside. 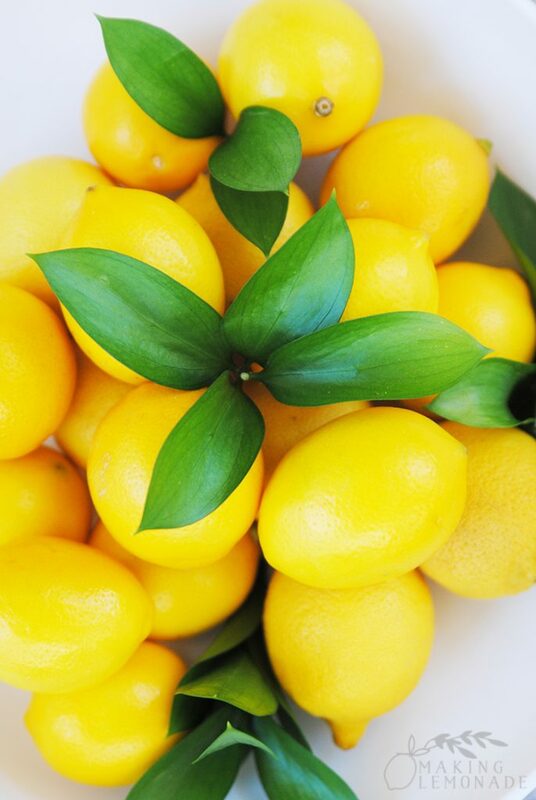 I used three small bags of lemons from Trader Joes (the ones in most other grocery stores would be bigger) and a filler stem from one of the other arrangements which I cut in several pieces and placed into the lemons to look like lemon leaves. Here’s how they look on my kitchen table, but I keep moving them around because they add brightness to just about every corner of our home! 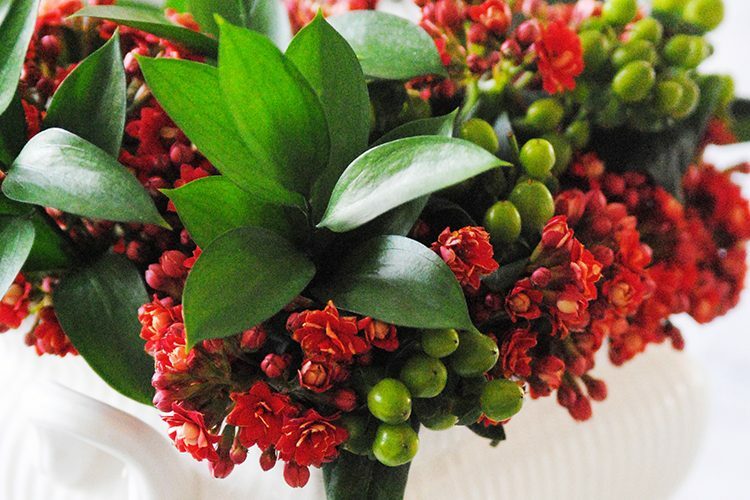 There you have it– seven ideas to brighten up your home with grocery store flowers. Even if you added just one to your shopping cart a week, it’s a minimal expense with tons of (happy) impact. Love it? 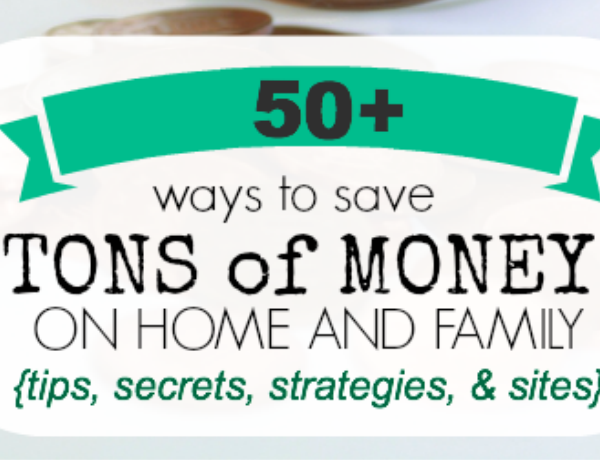 Pin your favorites from the post to share and save for later! 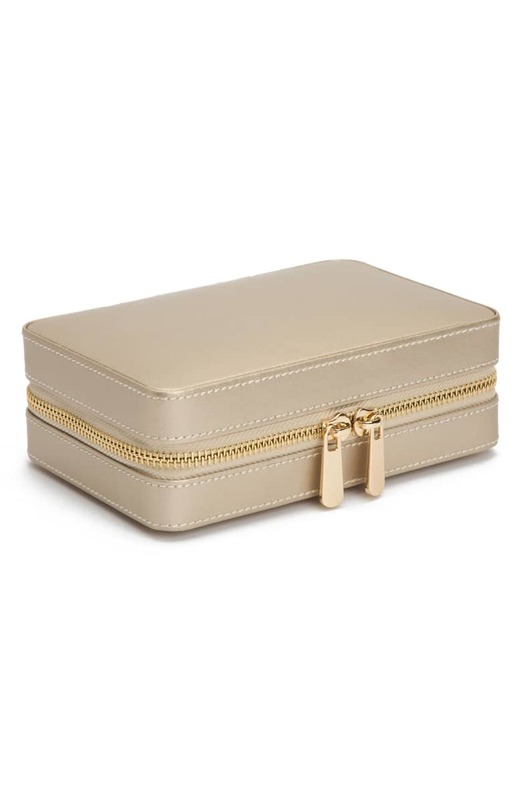 next post: It’s Our Annual Holiday Gift Guide Week!